We offer a fully Equipped panel shop with 1200 square meters of work space, 200 square meters office space and 500 square meters secure yard space. In our workforce we have 4 qualified Panel Beaters , 7 highly skilled paint shop staff and a qualified Spray Painter who I rate as one of the best . We are affiliated to and do work for Absa Insurance, Alexander Forbes, Compass Insurance, CTU Insurance, Etana, Infiniti, Lion of Africa, Mutual & Federal, New National, One Financial Services, Santam, Standard Insurance, Arbat Motors, Auto King, Barons, Blue Route Motors, Dave Alston Motors, Imperial, Moto Perpetuo, Thorp, Turner & Turner, William Simpson, S A Navy, S A Police and S A Army. We are members of RMI, SAARSA, SAMBRA, MERSETA and CRA. *We are owner operated and strive for a 100 % customer satisfaction and offer a written lifetime guarantee on our workmanship. 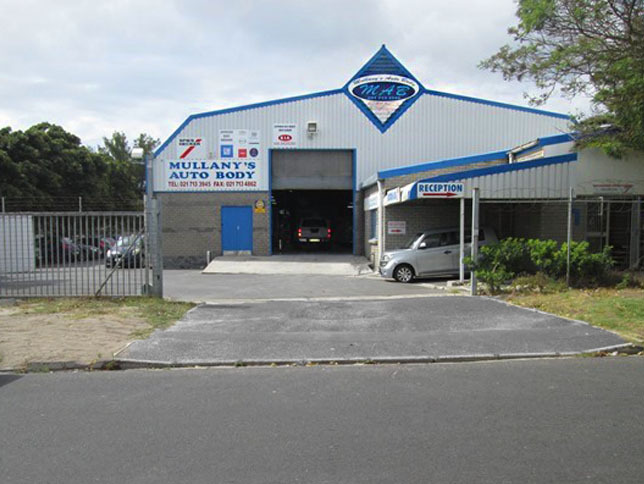 My son Wayne who is a partner and myself (Charles Mullany) qualifying as an auto body repairer in RSA and Canada since 1986 do our own quality controlling and can boast high quality with quick turnaround time. We collect and deliver anywhere in Cape Town and offer courtesy vehicles when required. Our vision is not to be the biggest but to be the best and always strive for 100% customer satisfaction. That is why we can offer a lifetime guarantee on our workmanship and will always stand by it. Our mission is to keep training staff to keep up the high quality we offer to our clients and to produce the best trades people in RSA in conjunction with MERSETA. We are the only warranty approved panel shop in our area.